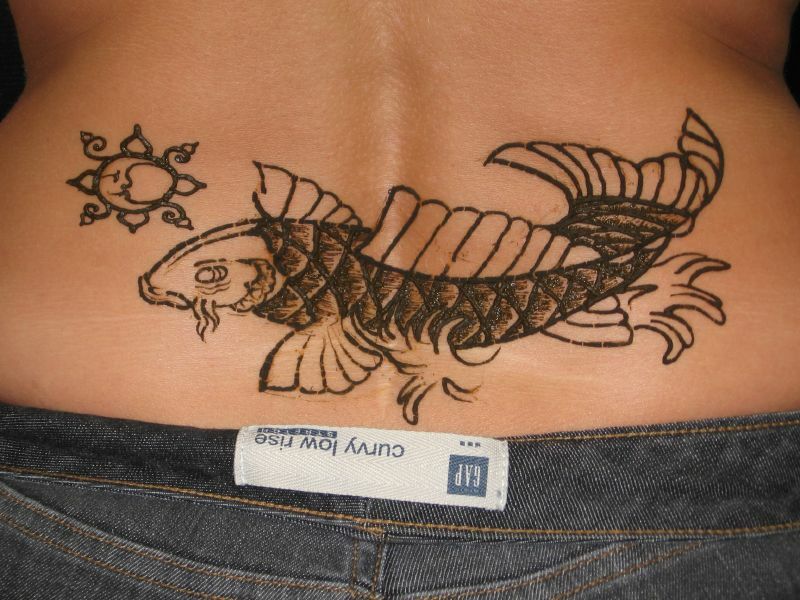 A really cool henna art of a Koi. The different words for henna in ancient languages imply that henna had more than one point of discovery and origin, and different pathways of daily and ceremonial use. Henna has been used to adorn young women's bodies as part of social and holiday celebrations since the late Bronze Age in the eastern Mediterranean. The earliest text mentioning henna in the context of marriage and fertility celebrations comes from the Ugaritic legend of Baal and Anath, which has references to women marking themselves with henna in preparation to meet their husbands, and Anath adorning herself with henna to celebrate a victory over the enemies of Baal. Wall paintings excavated at Akrotiri (dating prior to the eruption of Thera in 1680 BCE) show women with markings consistent with henna on their nails, palms and soles, in a tableau consistent with the henna bridal description from Ugarit. Many statuettes of young women dating between 1500 and 500 BCE along the Mediterranean coastline have raised hands with markings consistent with henna. This early connection between young, fertile women and henna seems to be the origin of the Night of the Henna, which is now celebrated world-wide. The Night of the Henna was celebrated by most groups in the areas where henna grew naturally: Jews, Muslims, Hindus, Christians and Zoroastrians, among others, all celebrated marriages by adorning the bride, and often the groom, with henna. The use of henna and mehndi by the Prophet insured its place in history and its popularity and acceptance among the Muslim people. Across the henna-growing region, Purim, Eid, Diwali, Karva Chauth, Passover, Nowruz, Mawlid, and most saints' days were celebrated with some henna. Favorite horses, donkeys, and salukis had their hooves, paws, and tails hennaed. Battle victories, births, circumcision, birthdays, Zar, as well as weddings, usually included some henna as part of the celebration. When there was joy, there was henna, as long as henna was available.